Trend News Agency is a leading news provider from the Caucasus, Caspian & Central Asian regions. Latest news from Azerbaijan, Georgia, Kazakhstan, Turkmenistan, Uzbekistan, Iran & Turkey. From just this post, what sign do you think you are getting? Discern it, believe it, & repent. As I have told you, it will get worse. I know this w/absolute certainty. 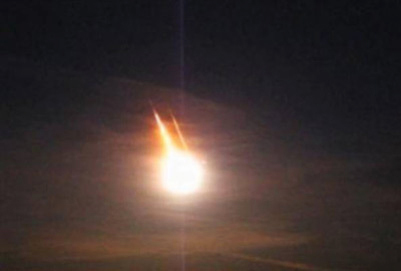 The meteor landed in Avaj in the province of Qazvin, Mohammad Ali Ahani, director of Qazvin Crisis Management Staff said, Mehr news agency reported July 31. Also, there have been reports that some pieces of rock have hit areas in Eshtehard, Alborz Province, Arsalan Qasemi, governor of Boeen Zahra, county in Qazvin Province, said. Another local governor of Takestan County, Qazvin Province, said that the area witnessed the passing of the meteor, but nowhere in the district under his supervision had been hit.